Smokeless Delite is one of those brands that are a cornerstone in the market. It is fairly simple for a new vaper to pick up their e-cig and begin to use it without too many questions. Smokeless Delite is one of those brands that are a cornerstone in the market. Since the market is young, to be an old company you only need to have been around for a couple years. Smokeless Delite has been around since 2008. They keep with current trends in the market for the most part, and seem to be dedicated to making their product easy to use. It is fairly simple for a new vaper to pick up their e-cig and begin to use it without too many questions. I like when companies seem to want to help people stop smoking cigarettes, as it is pretty much the worst thing you can do for yourself. Smokeless Delite also has a few key features that other brands don’t. Their most popular and well known product is the Premo. It is smaller than a lot of the batteries out there, and smaller than some of the ones you have seen people vaping. If you have seen someone with one of those disposable Blu e-cigs (which are ghastly, don’t waste your time!) they are about that big. 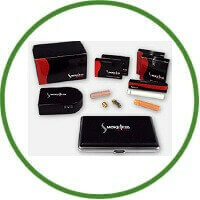 Their device has three parts, the atomizer, the cartridge and the battery. They also do have the option of using a cartomizer instead of the atomizer, but they don’t offer that in kits. Most of the brands nowadays come with cartomizers unless otherwise requested, so I wonder if that is something they should change to keep current. If you are unfamiliar with all these terms I am throwing around, let me explain. Most of the e-cigarette companies that sell kits like these have just two parts – the battery and the cartomizer, which screws onto the battery. Usually, the cartomizer looks a bit like a filter from an analogue cigarette. Inside of your cartomizer, there is e-liquid, which is turned to vapour by the heating coil element. The e-liquid has your nicotine and your flavour. This two part system is common and sometimes a bit more expensive. On the other hand, the three part system can leak and is also a bit trickier to use. If you opt to try Smokeless Delite, they have cartomizers for sale in packs of 5, and you can use them with all the other Smokeless Delite stuff. However, they are too expensive. It is about equal to so many other brands out there, it could have been any number of some of the mid level brands. The throat hit was fine, it was there and it was satisfying but it was not anything special. However, the vapour decreased pretty quickly as the battery died, so they got some solid points there. Smokeless Delite fully charged battery is good for about half a pack. Yes, it is small and cute and compact, and it does look and feel like an analog. If you are a new vaper, that is appealing! It is simple to start using, and it is not a terrible product, but I need more life from my e-cigarette batteries. It should be able to keep you going from when you wake up until you go to bed. There is a carousel of flavours on Smokeless Delite’s website. They have interesting and unique flavours and a whole lot of them too. From Gummy Bear to Apple, Grape Jolly Rancher to Tangy Tart, it’s a big selection. Their end result right now is their flagship L88 Premo battery. It is okay for newbies, as the size and feel is similar. They also have an auto-refill system that will deliver your goods on a recurring schedule. Their money back guarantee and their warranty are pretty good too. But the fact remains that they continue to offer the three part system as their default system, and it can be a bit unreliable sometimes. In addition, their cartomizers are too darn expensive and not that great. If you are just starting out and caught up on wanting something that feels familiar in your hand, this might be the brand for you. But there are deficiently better brands out there.